The bottles that Bulleit Bourbon are sold in are as beautiful as the liquid gold that they contain. Although Bulleit bourbon is aged fairly briefly (between 6 to 8 years, and released at the discretion of Master Distiller, Tom Bulleit) its taste and texture is very well structured. The secret lies in the original formula concocted by Augustus Bulleit, a Louisville tavern owner, around the year 1830. Bulleit’s Bourbon has a high percentage of rye in the mash bill, around 28%. 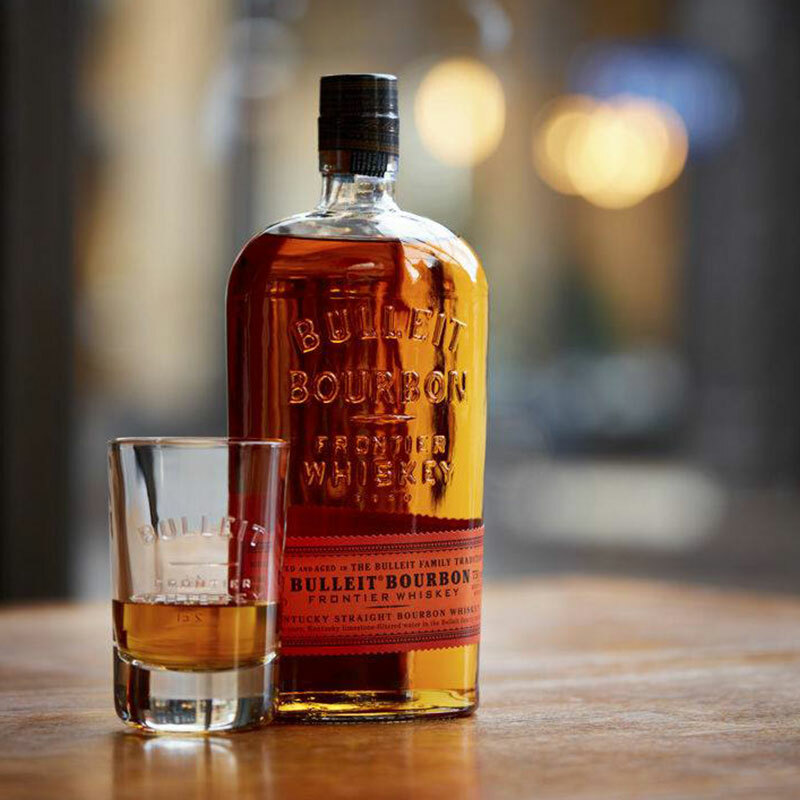 Bulleit is aged for around six years in high toast American oak barrels. According to folklore, Augustus disappeared while transporting his whiskey to New Orleans in 1860, but the formula was revived by his Great, Great Grandson and Master Distiller Tom Bulleit. Bulleit has done a masterful job of navigating the rapidly changing bourbon landscape. Through consolidations and growing pains, Bulleit Bourbon has become a high-quality and low-cost industry leader! I had heard great things about Bulleit since I first began enjoying bourbon. At around $4 a pour here in Louisville, I was a little apprehensive about the positive reviews. You know how it is: guy gets a bourbon for cheap and so that’s what he learns to like. Then you come along looking for a decent whiskey and he hypes the cheap stuff up as if it were the Kings wine. But I can honestly say that Bulleit lives up to the hype – dare I even say that it is under priced at $25 for 750/ml here in Kentucky. I first tried Bulleit in a simple rocks glass (didn’t feel the need to break out the Glen Cairn). I sip and swish and am greeted with a great, medium bodied texture, much to my surprise. Most younger bourbons tend to sting and dissipate fairly quickly, but Bulleit was delightfully textured. The first note that I am greeted with is spice. Not surprising, considering the high rye composition in the mash bill. As the spice note recede, I’m hit with notes of apricot and peach. A very nice surprise that finishes in caramel and vanilla. Bulleit is by no means a top shelf bourbon, but it’s not a well whiskey either. For the price and quality, every bourbon drinker should have a bottle of this on the shelf. It’s a great standalone bourbon, but versatile enough to be used in Manhattans or whiskey sours. I give Bulleit a B-. What do you think? Have you tried this bourbon, or the Bulleit Rye? Leave us a review below with your own thoughts and tasting notes! I like both the Bourbon and the Rye and usually have at least one around. Not as sweet as something like Woodford Reserve and better balanced that most. Both the Bourbon and the Rye are good in an Old Fashioned. I have trouble getting to the price point of the 10yr though. Once I approach $50 I’ll move to a single barrel Bourbon. I always have the 1.75 in my stash as well as the rye. I find both very enjoyable, flavorful an aromatic delight. It’s older brother, the 10 Yr may be a bit pricey but sometimes you get what you pay for…or more! My everyday bourbon my favorite for the money I am a huge Buffalo Trace fan but this just has more pop. Neat, on the rocks , or mixed it taste great. Your bourbon collection is not complete without the Bulleit Frontier Bourbon. To me is better than the other higher priced Bulleit versions. For a mid shelf bourbon this is one of the best, and, imo, outshines a lot of more expensive bourbons. Lots of flavor. Got a bottle for a gift .. recipes?